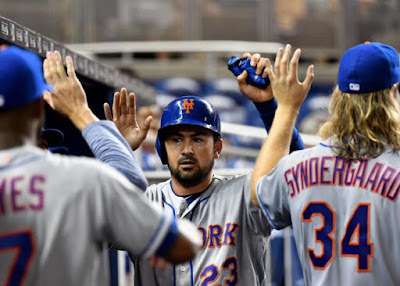 April 10th 2018: Mickey Callaway's hot New York Mets took the field in South Florida, feeling real good. They were in first place in the NL East, they were on a six game win streak & were off to one of the best starts in franchise history. After tonight's come back win, they had to feel even better about themselves, they were now officially off to the best start in team history, had a resilient come back win & 3 1/2 game lead in the NL East. Micahel Conforto led off the game with a base hit, he's batting .313. Two batters later Wilmer Flores doubled, bringing in Conforto. 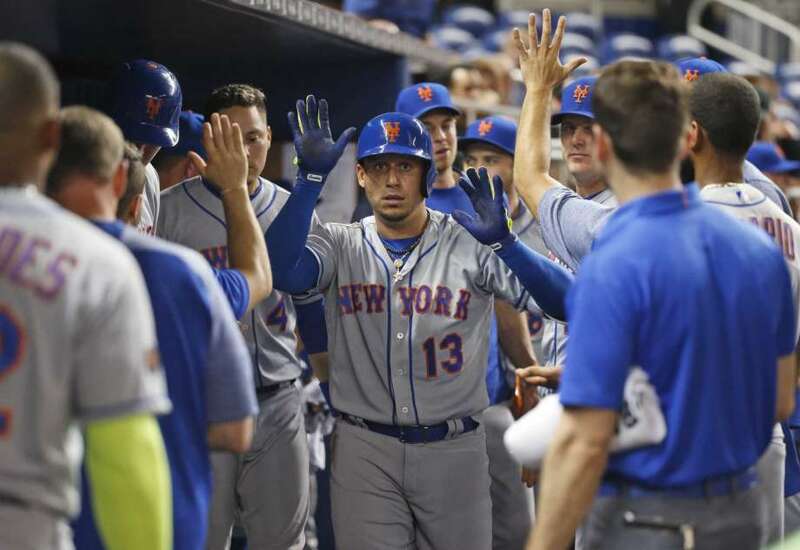 The Mets added another in the 4th inning, as Asdrubal Cabrera hit one of his two HRs on the night. 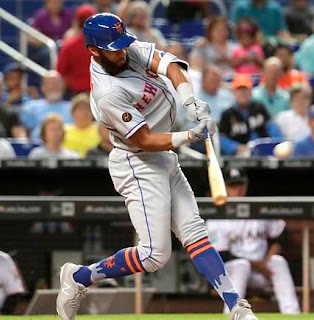 In the 5th, Amed Rosario doubled, he's now batting .290. Then Michale Conforto got his second hit of the night, a single scoring Rosario to make it 3-0. A nice cushion of a Met lead with Jacob deGrom on the mound. But deGrom is human & tonight he struggled. In the 4th he gave up three straight singles, then a sac fly to Starlin Castro, bringing the Marlins within a run at 3-2. Justin Bour then delivered a two run HR giving Miami a 4-3 lead. But these Mets are resilient, in the 6th Todd Frazier doubled and went to third on Cabrera's fly out. This another example of the aggressive base running, Mickey Callaway has been promoting. Juan Lagares then hit a sac fly to center, scoring Frazier to tie the game up again. Lagares is batting over .400 this early on. In the top of the 7th, Marlin pitcher Drew Steckenrider struck out Amed Rosario, Michael Conforto & Yoenis Cespedes. 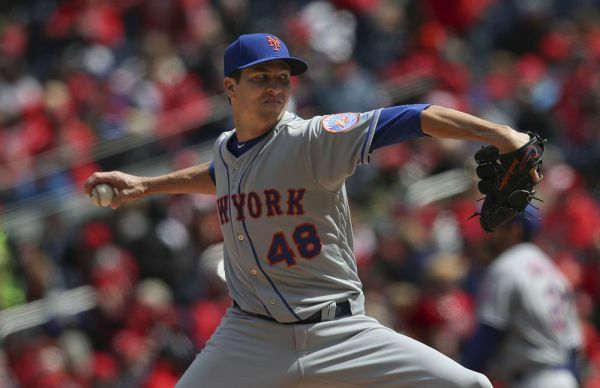 After the 7th inning stretch, another Jacob, Jacob Rhame relieved Jacob deGrom. He allowed a lead off double & the second HR of the night to Justin Bour, giving the Marlins a 6-4 lead. Oh, but when your hot on a win streak & determined like these '18 Mets are, things turn out good. In the top of the 8th Wilmer Flores hit his first HR of the season, his second hit & second RBI of the night. Then the hitting star of the game Asdrubal Cabrera blasted his second HR of the night, number three on the year. On this night he also homered from both sides of the plate. Mr. Cabrera, now batting .341, is sure happy to play any where this year! This wacky game was now tied at six. In the 9th, Marlin pitcher Brad Ziegler came on, after pinch hitter Jay Bruce grounded out, Amed Rosario reached on a throwing error by third baseman Brian Anderson. Michael Conforto then walked. Next, Yoenis Cespedes doubled down the left field line bringing in both runs. 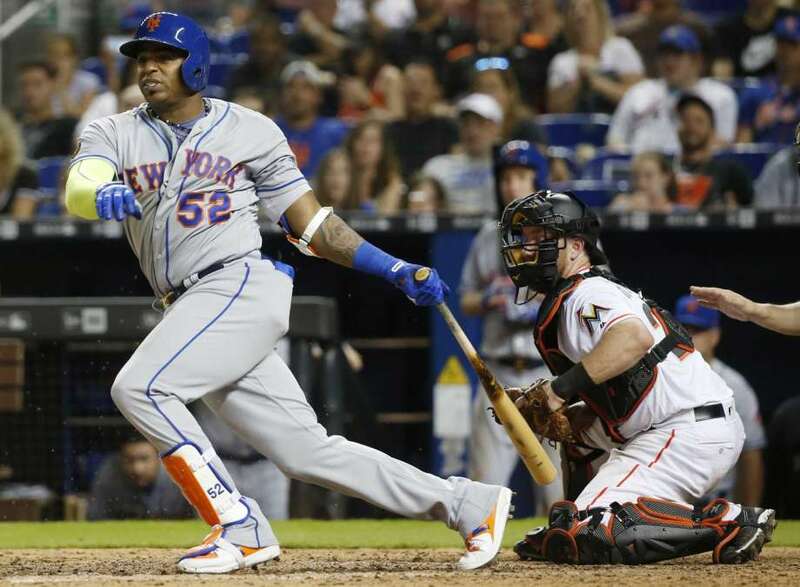 Cespedes now has 10 RBIs, third best in the NL. 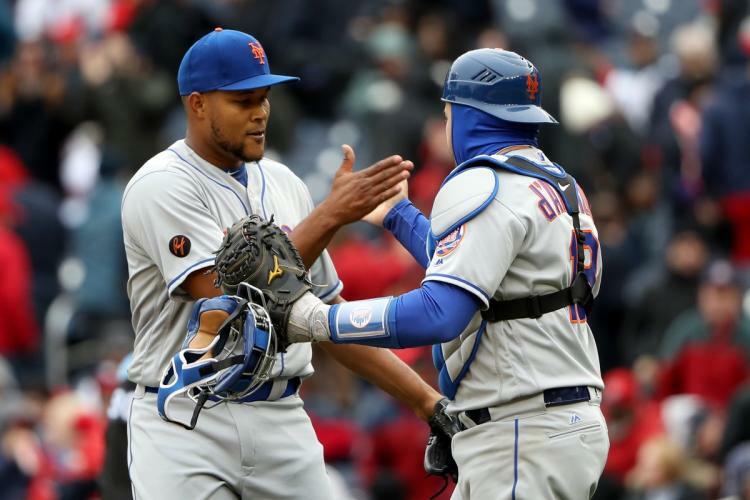 It was all the Mets needed for the 8-6 win, as Jeurys Familia collected his league leading 6th save in his league leading 7th appearance. The Mets seven game win streak continued, their best since September of 2016 & the 2018 Mets were off to their best start ever! Trivia: Todd Frazier has brought a new hand signal celebration to the team & even had t-shirts made. When a Mets player reaches base, they twist their hands above each other, representing the salt & pepper shaker. So far it seems to be spicing things up, so were fine with it. After an impressive Opening Day win, the Mets took two of three from the St. Louis Cardinals to open the season. SundayApril 1st would mark the last time the Mets lost a game through the next week of play. After a rain out they swept a two game set with the Phillies & then went on The Nations Capitol for an important three game series with a familiar rival. 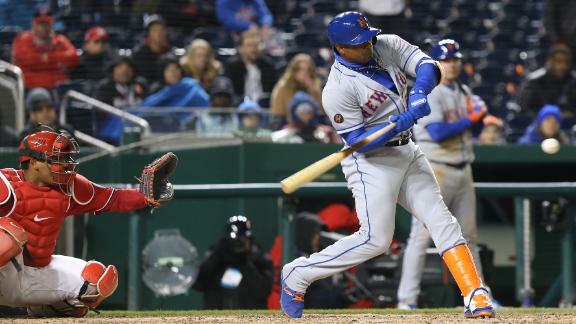 Thursday April 5th: The Mets spoiled the 2018 Washington Nationals home Opener, as they began the season series with their NL East Rivals. The Mets bats continued to hit, today with eight hits & scoring runs. 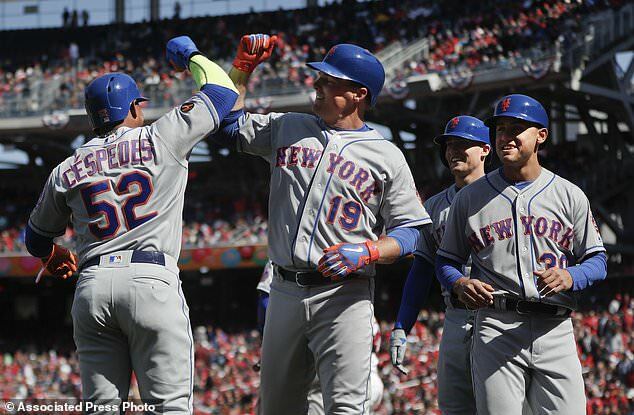 The big blast came on Jay Bruce's first round tripper of the year, it was a big one, a grand slam on the 7th inning, sealing the Mets win. Also HRs from Yoenis Cespedes with his third of the season & Michael Conforto's first, in his 2018 season debut. 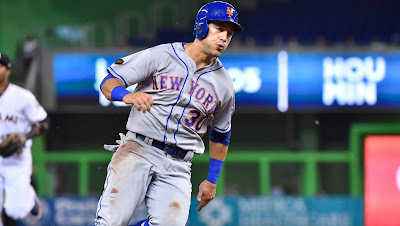 Conforto returned to the line up much quicker than expected, flowing last years surgery recovery. The Nats Steven Strausburg also helped the Mets with a bases loaded balk, in a moment of cluelessness on the mound in the top of the 2nd inning. 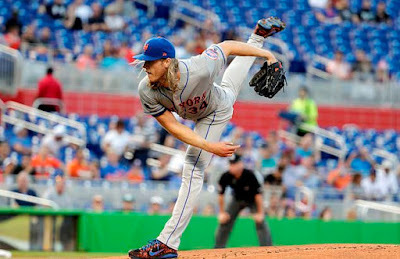 Jacob deGrom would go six innings, allowing two runs (both on RBI hits to Anthony Rendon) on four hits & one strike out to best his record to a 2-0 start. 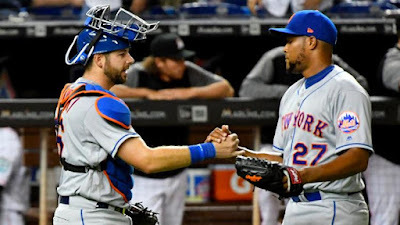 The Mets flawless bullpen had Jerry Blevins & Robert Gsellman shut down the Nats in the home 7th, as Hansel Robles & Seth Lugo closed out the final two scoreless innings. Mets win it 8-2. Saturday April 7th: Steven Matz would pitch a fine five inning, eight strike out game, allowing just three hits, two walks & an unearned run. That run came in the 5th, after Michael Taylor got on base after a Todd Frazier error. Taylor was sacrificed over, stole third & scored on a Pedro Severino single. The Mets tied it in the 6th, as Frazier made up for his error with a double. Travis d'Arnaud singled him in. After Hansel Robles served up Bryce Harper's 4th HR of the year, the Mets regained the lead in the 7th. Amed Rosario singled & scored on Asdrubal Cabrera's double. After moving over to third on a force play, he scored when Frazier grounded out to second. 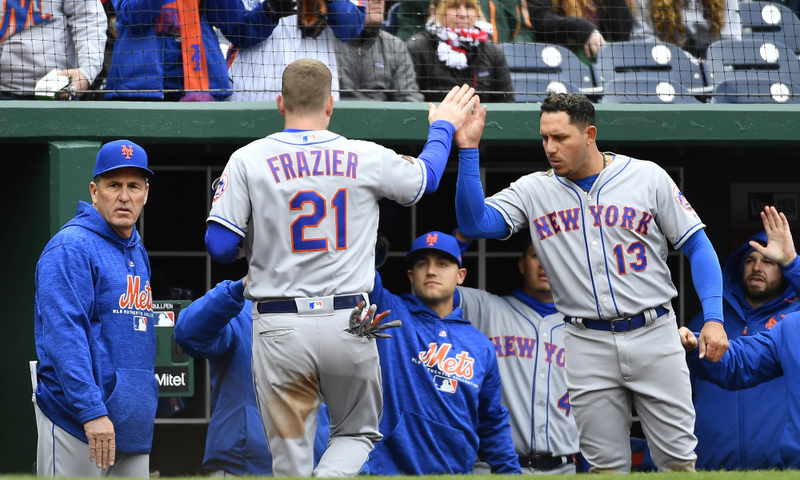 The 2018 Mets aggressive base running that was stressed by new manager Mickey Callaway has been very successful. The Mets bullpen of AJ Ramos & Jerry Blevins got New York to the middle of the 8th. 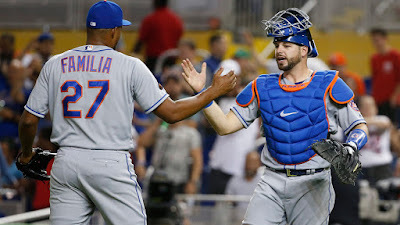 With Harper on board, Jeruys Familia was brought in to get a five out save, in which he did, his fourth of the season, sealing the 3-3 thriller. Sunday April 9th: The 6-1 Mets entered The Sunday Night Game of the Week, looking for a sweep of last years divisional winners in D.C. Mickey Callaway sent a rejuvenated Matt Harvey to the mound against Tanner Roark. Bryce Harper greeted Harvey with his league leading 6th HR of the year, making it 2-0. But in the 3rd, Tanner Roark gave the Mets some helping issuing three straight walks. 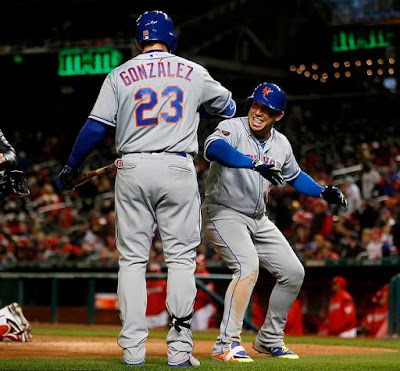 Then new Mets first baseman, Adrian Gonzales blasted a grand slam, the Mets second granny in the series, a first in Mets history. The Mets had never before hot two grand slams in the same series. The 35 year old Gonzales certainly has something he wants to prove to the baseball world this year, he is not done. Asdrubal Cabrera added a solo HR in the 5th, and Harvey exited with a 5-4 lead after five innings & nine hits, four earned runs, one walk & two K's. Robert Gsellman pitched two innings, but in the 7th walked Bryce Harper and gave up a pair of singles tying up the game. In the 8th, Mets catcher Travis d'Arnaud, threw out Anthony Rendon trying to steal second to end the inning. In the 9th Seth Lugo walked Bryce Harper to start out the inning. Lugo's pick off attempt sent the ball down the right field line advancing Harper. He should have went to third but a lack of hustle helped the Mets when Matt Adams flew out to left. 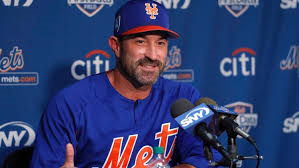 Then in a gutsy call, Mets manager Mickey Callaway chose to load the bases walking the next two batters. Lugo then stepped up & impressed by striking out Michael Taylor (swinging) & Pedro Severino (looking). In the home 10th, the inning ended on a play that was reviewed, as Bryce Harper grounded out to first base & slowed up as he approached the bag. The play had Lugo fall to the ground but step on the base as he bare handed the ball. Had Harper hustled he may have been safe. Finally in the 12th, the Mets struck. It seems this 2018 cast will get you if you don't put them away. Juan Lagares led off with a base hit. Amed Roasrio bunted him over. Yoenis Cespedes came through with the game winning RBI single. Jacob Rhame put the Nats away in the bottom of the frame, although there was some drama as Wilmer Difo doubled with two away. But Rhame got Adam Eaton to ground out. 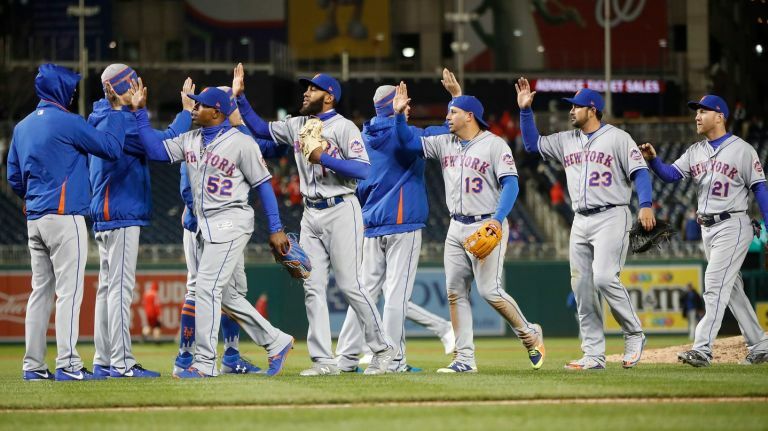 The Mets went to 7-1, and sent an early message to the Nats in their own ballpark. Monday April 9th: From the cold North East weather, the Mets traveled down to sunny South Florida to take on a rebuilding Marlins team. They arrived in Miami at 5am & their manager gave the veterans an option to rest. They all said they wanted to play, as they are enjoying this Amazing 2018 start. Noah Syndergaard, who struggled with blisters throughout the game, allowed two runs on five hits ad amazingly walked two batters in the same inning, while striking out five. It was enough to get him to 2-0 on the season. The Mets continued to hit, in the 2nd Todd Frazier walked & singles from Asdrubal Cabrera & Adrian Gonzales made it 1-0 Mets. Kevin Plawecki grounded into a double play but abrera scored with the second Mets run. In the 3rd, Amed Rosario just missed a HR, doubling off the light green wall in right field. A Jay Bruce base hit would score him. In the 7th, Gonzales walked, and a Marlins fielding error put him on third & Brandon Nimmo on first. Amed Rosario then singled for the 4th & final Mets run. That bullpen again, although Hansel Robles gave up two hits, he did not allow a run. Jerry Blevins, & AJ Ramos set it up for Jeruys Famila, who earned his fifth save already. 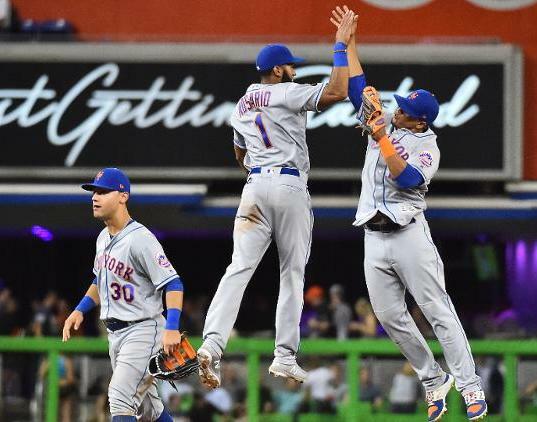 The 8-1 Mets were officially off to the best start in team history, matching 8-1 records in 1985 & 2006. Quotes- Jeurys Familia: "It's awesome, I think everybody's tired today. But at the same time, we're hungry to keep playing the way we're playing right now." 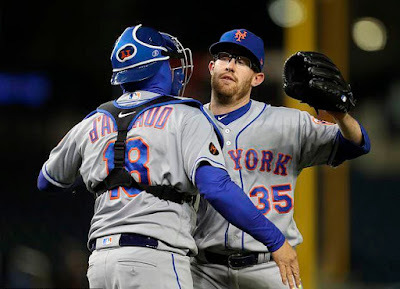 Manager, Mickey Callaway on his bullpen & their 1.12 ERA: "I feel like they're all going out there throwing the ball over the plate, not beating themselves. If we're going to get beat, it seems like the other team's going to have to do it right now. So we have a lot of confidence in those guys."